It's a Bill! HAMES and New Jersey Legislation finalize the Student Samaritan Initiative Bill, a law that requires applicants for driver’s license under age 18 to submit proof of first-aid, CPR, and automated external defibrillator training to the DMV. 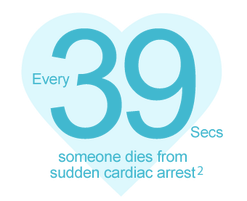 The Cause*Over 450,000 out-of-hospital Sudden Cardiac Arrests occur annually, as reported by the American Heart Association. Unfortunately only 12% of these victims survive, with barely a fraction of these who walk out of the hospital. Recent scientific research has shown that effective and proper bystander CPR can double, or even triple a victim's chance of survival. With better training comes better survival outcomes. *"WHEREAS, When combined with a timely response by emergency medical services, CPR can drastically increase a cardiac arrest victim’s chance of survival; and WHEREAS, Encouraging boards of education to include CPR training as part of the high school curriculum will provide students with crucial life-saving instruction and will drastically increase the safety of the State’s citizens"